I’m writing this blog hours before the final counts are in, but I wanted to put this idea out into the universe. Today it took me 2.5 hours to vote –that was the longest For me since I became eligible to vote. There were two precincts voting in one place and it was obvious that voter suppression was at play. The city I live in is a metro area to Detroit. There are lots of townhomes, apartments, condos and houses in this area. Instead of dividing the two precincts in my area by addresses, congressional districts or even a Jedi using the force, someone decided that the homowners should vote in one precinct and everyone else in the other. The result: homeowners could vote in less time than it takes to make a country breakfast. The other group might as well been standing in line for a roller coaster ride at cedar point on their busiest day! This was not just a divide by race (because there were some African-Americans disproportionate in each group) but financially as well. As I stood in line I had this idea; what if before the election a proposal to impeach the Secretary of State was on the ballot in every state? So, if you didn’t like the way voting was arranged then you could do something about it immediately. It’s as if minorities in America expect things to be unfair. We put up with all kinds of “stuff” assuming that we won’t get a fair shake in this country. I’m still wondering why voter suppression is not a federal offense punishable by mandatory jail time. Lol! I’m not wondering…I know why and so do you. 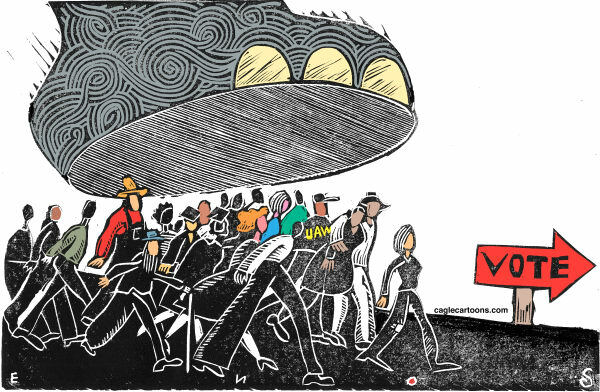 Voter suppression is as blatant now as it was when African-Americans were first given the right to vote. All of this is being done to “buy” our government. If “we the people” continue to lay down for these shenanigans then our government will be up for sale. If we sell our government into slavery, then doesn’t that make us all slaves? Next Post Would you dare to die?